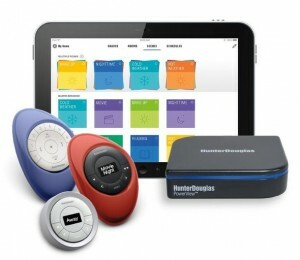 The PowerView Motorization system from HunterDouglas installed by Benjamin Draperies. Automation systems are rapidly becoming more affordable and consumers are more willing than ever before to motorize their window coverings. Consumers also appreciate the improved safety of a product without accessible operating cords that can pose a risk to children or pets. It is also more aesthetically pleasing eliminating the cords and creating a clean, uncluttered look ideally suited to both homes and businesses. Our motors are quiet, compact and reliable. Benjamin Draperies, feature motorization options that utilize the latest technologies and accessories available in the industry. This technology allows our clients to select the right combination of controls that meet their needs. Each motor can have a single control or multiple controls programmed to it. Motorized shade (cellular, pleated, solar, roller, soft roman and natural shades) lift operation: shade raises, lowers and can be programmed to stop at your preferred set point. Motorized blinds (wood, composite, vinyl and aluminum blinds) feature tilt-only operation: blind slats tilt open and closed, up or down. Operate remotely throughout your home with the Pebble Remote Control or from anywhere in the world with the PowerView® App. Schedule your shades to automatically open or close during sunrise and sunset. Integrate with other home automation control systems like Nest®, IFTTT, Logitech Harmony Home, Control4®, Elan® Home Systems, Savant® Systems, and many more.